Picked this up at a jumble for £20 - the base was moving, just, very stiff - but clicking. Top end was seized solid. Trouble was I had it at home and had no winch handle - so wasted a bit of effort trying to get the top off. Once I madeup a square hardwood peg to serve as a temp handle, plus adjustable - I realised the top unit was just real stiff in its housing. The peg actually was useful - as it forces into the socket and serves to get some outward pull on the top inset, while turning. Bit of a dodgy pic - but it will suffice. 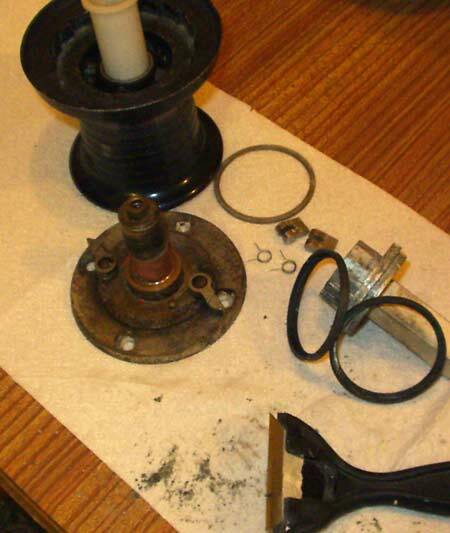 There is a single screw on top of that central spindle.base of the winch socket hole. Once out - the black drum should pull of the lower unit. Mine was very stiff- and the white liner came out with the lower unit. There are two cams and springs on the base plate. The problem is the liner. It would slip nicely over the lower spigot once cleaned up - but would have been a very tight fit into the black housing. The trouble being - if it won't go right in once you have started whacking it - it may not come out again ! I think overuse of oils etc can swell liners like this. I made it a nice, snug sliding fit by 'very gently' scraping all around the outer circumference. It only needs a touch. A new blade in a window scraper works well - better if you know how to turn the edge to make it a proper scraper. ( this is actually one of my violin making tools ! - on an oily old winch..! ) Its almost impossible to wet sand nylon - but it scrapes really nicely. Don't overdo it - or the winch will be loose. This really was confusing - I just couldn't see how it came out. The big spiral, circlip obviously held something in - and surely the winch should ratchet back on the handle. Once I made up the peg ( still in the top plug ) so I could give it some welly, with the barrel firmly wedged in the vice, I realised it did turn - just. The silver alloy winch socket - plus the two hard rubber/fibre rings - just slide straight out of the top. The plug was of use in that it was a tight fit and I could pull on it, to force it out while I turned it. When looking at the top end - the gap between the alloy winch casting and the alloy socket - is all fibre washer. Its strange stuff - it has to be pretty stiff, as its only the washer which is held by the circlip. Sort of like brake lining material - but obviously not abrasive. Don't beak one ! - would be real fiddle to make up something to do the same job. Under the top socket cap are two cams and springs. They come out by easing the small spring tail toward the cam arm - then lift the whole cam and spring upwards. Need a bit of lateral thinking to replace - but I was used to them from my other winches. Basically you pinch the two end of the spring together - place the body of the spring inside the slot of the cam - then drop the whole lot into the round hole. Easier done than said - if you get my drift ! These are standard, Lewmar I think - and are the same as in my Girdlestone winches. It was all incredibly gunged up in there - a bamboo skewer and turps works well. Ideally - this black casing is heavily anodised and should come clean, but one cam lobe housing had pickled through to the alloy. So long as its well cleaned/scraped smooth and greased the cams will work ok - just need a look at more often. These are very well made winches. As with all stuff that ends it days at a boat jumble - just horribly uncared for. The quality shows though - when you give it some much needed attention. 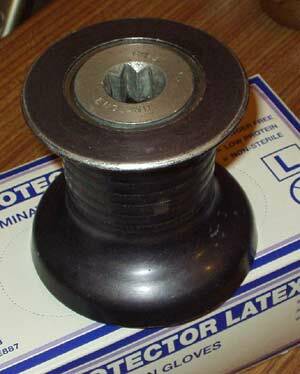 The upper alloy socket, with its two hard rubber rings, was an immpossibly tight fit. These two rings pull off, from either side of the socket alloy casting once its out. The problem was corrosion in the alloy under them. Cleaned off - and all the hard gunge scraped away - and the alloy socket scraped clean with a bit of a wet and dry sand up - they slipped back in nicely. I'm not sure whether the intention was to grease these hard rubber rings, or if they were self lubing ? They are very stiff stuff - almost like fibre rather than rubber. I've put them in dry for now - but have to split the winch to fix it, so will maybe silicone grease them. The nylon liner I greased with silicone grease, which does not affect plastics - and used copper grease on the cam lobes. since I had a tube to hand - and I like copper grease ! Twenty quid well spent on this one. Its for the coachroof when I do the main halyard onto a spinlock clutch. Maybe will add the kicking as well on a double clutch - or if I'm feeling flush get a triple and do the topping as well.